This is a fine example of how cowboys call on their animal buddies to give them a hand. 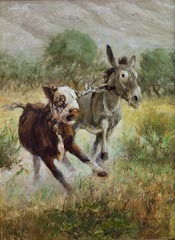 Burro’s make handy lead animals, they will head to the house as that is where the feed bucket is. Feed buckets have gentled as many animals as any tool that man has come up with. Things may start out a little rough for the Maverick bull, but it won’t be long until the burro has softened the bull’s sides and his attitude softens quickly thereafter. The bull will realize it’s much easier to follow the burro than to try to run the show. Hazards come with most jobs in the cow business and some animals aren’t suited to the job at hand. Some burro’s take a big offense to being tied to such an ill adjusted critter and can deal some very harsh treatment to the maverick which isn’t profitable and this is always the most important guideline for a good cowboy’s methods. A good cowboy will make the job as easy as possible for the burro. After he catches the maverick, he will tie it to a tree by the neck and leave it tied short by the horns or neck. This will teach the maverick that pulling and fighting pressure is generally a loosing battle. This will take a lot of the fight out of an animal and get him mentally ready to follow his new buddy to his new home. All the variables of gathering livestock come into play; terrain, equipment, animals, weather and most important experience. These conditions of the situation are what make the best hands and it’s there where you will find them still. It’s far too exciting, working in these conditions, to waste too much time in town. The best cowboys don’t require human desires of normal securities like retirement benefits, health insurance and 401K plans. They just need the cow, the horse, some simple fare and plenty of space to work in.